Prince of Transylvania 1571-76; king of Poland 1575-86, in succession to Henry of Anjou, who had left the kingdom in order to occupy the throne of France as Henry III. At this election Solomon Ashkenazi, the physician and adviser of Sultan Selim II., made his master's influence felt in behalf of Bathori. Bathori instituted an eminently liberal policy with regard to the Jews. In 1576 he issued two orders prohibiting the charges brought against them of ritual murder and of the profanation of the host. In 1575 he issued a decree abolishing all restrictions on Jewish commerce, and permitting the Jews to buy and sell goods even on Christian holidays. In the same decree he also abolished the older law which placed Jewish minors under the guardianship of Christians, and put them instead under that of the Jewish rabbi and alderman. He enforced the old decree of Sigismund I. (1506-48), making municipalities liable for losses incurred by Jews during riots. He also decreed that the murder of a Jew should be punished by death, just as the murder of a Christian. In the same year, when the Jewish community of Posen was threatened by a Christian mob, Bathori sent strict orders to the city council to take measures for the preservation of order, but without effect. Three months after the issue of this decree, a riot broke out in the Jewish quarter of Posen, accompanied by pillage and several cases of murder. Bathori imposed a heavy fine on the town council, but the members testified under oath that they had not been aware of the contemplated attack, and the fine was remitted. At the diet of Warsaw, Jan. 2, 1580, Stephen confirmed the former privileges of the Jews and granted them some additional advantages in trade and commerce, instructing the city authorities to guard their legal rights. 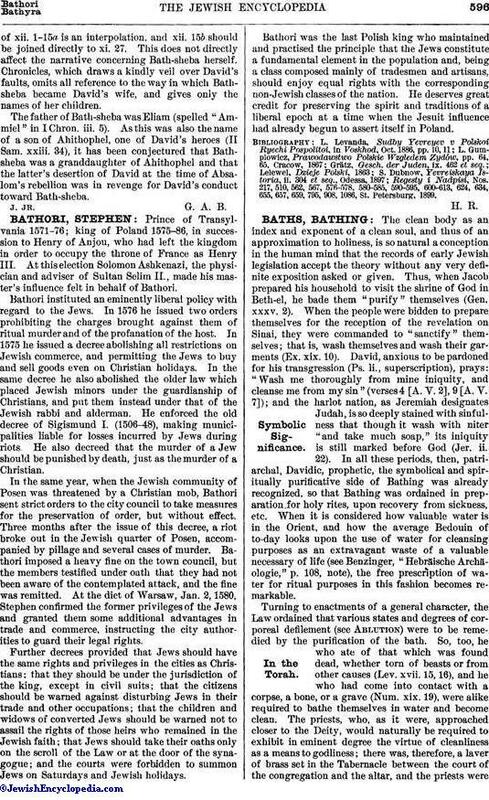 Further decrees provided that Jews should have the same rights and privileges in the cities as Christians; that they should be under the jurisdiction of the king, except in civil suits; that the citizens should be warned against disturbing Jews in their trade and other occupations; that the children and widows of converted Jews should be warned not to assail the rights of those heirs who remained in the Jewish faith; that Jews should take their oaths only on the scroll of the Law or at the door of the synagogue; and the courts were forbidden to summon Jews on Saturdays and Jewish holidays. Bathori was the last Polish king who maintained and practised the principle that the Jews constitute a fundamental element in the population and, being a class composed mainly of tradesmen and artisans, should enjoy equal rights with the corresponding non-Jewish classes of the nation. He deserves great credit for preserving the spirit and traditions of a liberal epoch at a time when the Jesuit influence had already begun to assert itself in Poland. Regesty i Nadpisi, Nos. 217, 510, 562, 567, 576-578, 580-585, 590-595, 600-613, 624, 634, 655, 657, 659, 795, 908, 1086, St. Petersburg, 1899.